I have to wonder why no one though of this before?!?! Say good-bye to confusing cable nests, cluttered A/V components, complicated set-up and that pile of remote controls. 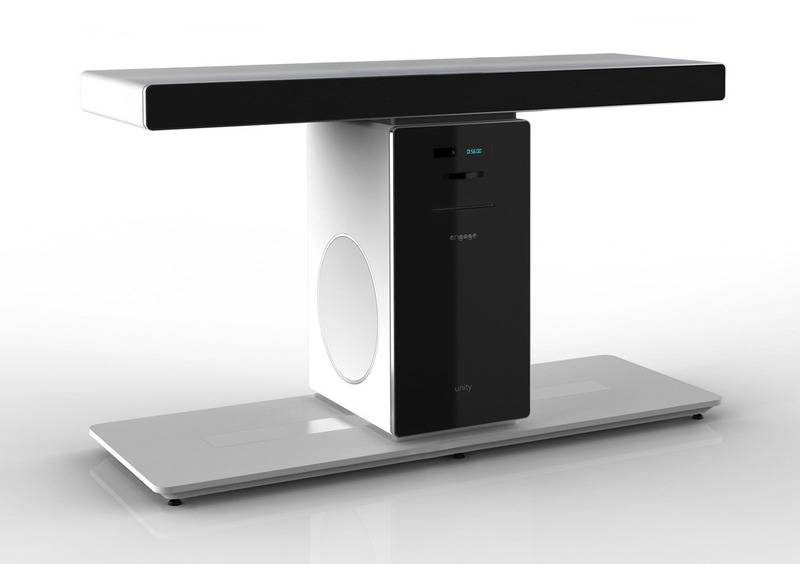 Meet the Unity Home Theater System. It’s a unique product designed to create a new category in the consumer electronics marketplace. The system will be making its debut at CES at the Eureka Park TechZone (Booth #74001) at the Venetian Resort. Unity combines elegant design and an immersive A/V performance with full-range speakers in a pedestal style platform called the tShape™ to provide consumers with a simple lifestyle solution delivering a superior home theater experience. It is expected to be available across select retail channels in mid-2012, at a target MSRP of $999. Unity, which recently won the Consumer Electronics Association’s Innovations 2012 Design and Engineering Award, is not only designed to fill the gap between soundbars, HTIBs, and separate components, but provide consumers with a new way to interact with their entire media library. Beauchamp is joined by Chief Marketing Officer Mike Fidler, a former Sony Electronics senior marketing and engineering executive and the CEO of Digeo, Inc., a Paul Allen-owned company that developed advanced home entertainment technologies. Unity uses advanced acoustic modeling and a proprietary speaker configuration to create a dynamic sound field that engages consumers without overpowering them. It features all the electronics needed to deliver 5.1 channel Dolby Digital Surround Sound including an integrated amplifier, dual 10-inch subwoofers, integrated center, left and right channel speakers and a 5.25-inch down-firing midrange, along with an integrated Blu-ray/DVD player. It’s designed to support any brand of flat-screen TV up to 60 inches and features a single-wire connection using HDMI 1.4a. It also has connections for iPhones and iPods and Ethernet. Future versions are expected to feature interoperability with a host of IP devices, wireless connectivity and access via Over The Top (OTT) services. All of the features are packed into an elegant, space-saving design. The sophisticated, industrial design was created by RKS, an award-winning global design consultancy based in Thousand Oaks, Calif. The Unity Home Theater System will be marketed under the Engage™ brand of In2Technologies, headquartered in San Jose, Calif.